Link with a professor of Chinese at Fudan University, Shanghai. My father was a radical leftist professor. He led study tours to the Soviet Union in the 1930s and later admired Mao Zedong. 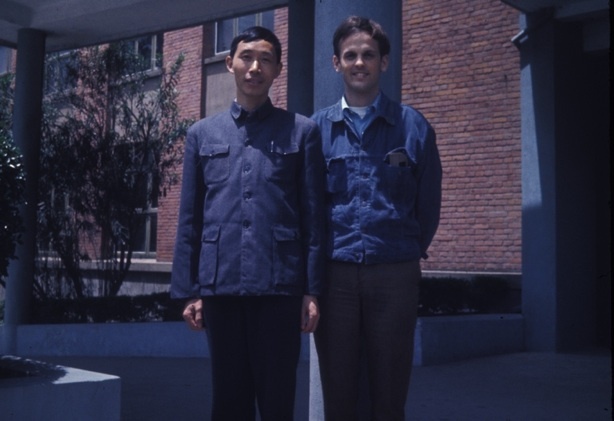 That influence, in addition to the passion in the late 1960s and early 1970s within the American student movement against our country’s war in Vietnam, a movement in which I was not only a participant but an activist, led me to look at socialist China with very high hopes. The first time I tried to go to China was in 1967, the year after I graduated from college. I was living in Hong Kong and wrote a letter to Beijing. A few months later I received a charming reply: two sheets of paper that appeared as if a Red Guard with little English and a faulty typewriter had spent days laboring over, a letter in which it was explained that the Chinese people had nothing against me, but that I was from a predatory imperialist country and could not visit the People’s Republic. Before I left Hong Kong I bought four volumes of The Selected Works of Mao Zedong, and, rather grandiloquently, ripped the covers off of them so that I might carry them safely back to the imperialist U.S. Anyway, a year later we U.S. interpreters asked if we could visit China, and the answer was yes. During four weeks we visited Guangzhou, Shanghai, Suzhou, Xi’an, Yan’an, Beijing, and Tangshan. The bill for the trip—room, board, airfare, rail, sightseeing, everything—was $550 U.S. It was a friendship rate. But it was during that trip that cracks began to form in my ideal image of the People’s Republic. I carried a small camera and took walks on my own, in search of “real life.” I had learned in graduate school that there were no flies in China after the “Four Pests” campaign of 1958. When I saw a fly on a white stone table in Suzhou, I photographed it. I thought I had something. In Yan’an, when four of us foreign guests boarded a crowded bus the driver shouted “waibin!” [“foreign guests!”] Immediately four seated passengers stood up, offering us their seats. The old man who stood up next to me did not, in my impression, seem to want to. I said, “Please, you sit,” but he said nothing and remained standing. Embarrassed, I remained standing, too, and for the rest of the ride the people on the bus endured the ludicrous spectacle of an empty seat on a crowded bus. We foreigners always rode “soft sleeper” class on the railroad, while most people on the same trains were riding “hard seat” class. I asked our guide about it. “Why?” I asked, unaware that it was a stupid question. My image of a classless society had suffered a blow, and it suffered a few more blows before the tour was over. The example that sticks most in my mind happened in Tangshan, where we visited the huge Tangshan coal mine. We descended in an elevator far below the earth’s surface. (This was three years before a Richter 7.8 earthquake buried countless workers in that same mine.) Riding small railroad cars through a maze of tunnels deep underground, I noticed various signs: “slow!”, “sound horn!”, etc. The signs were in traditional Chinese characters, not simplified ones, and I also couldn’t help noticing that there were no political slogans among them. All the signs were strictly business. This contrasted sharply with the surface of the earth, where slogans and quotations from Chairman Mao, on splendid red-and-white banners, or giant red billboards with gold writing and trim, were everywhere. She seemed a bit irritated at me for suggesting such an inappropriate location for the Chairman’s thoughts. To me, though, it was a hard fact to swallow: the dirt of the mines was OK for the working class but not for the thoughts of its leader. The inner insecurity of the guides became apparent to me in something that happened in Shanghai, when I bought a souvenir of my trip for my mother. My mother was born on a farm in Nebraska and was a salt-of-the-earth type. Her name was Beulah, she ate wheat germ, and brown was her favorite color. In a small shop I found hand-brooms that I knew she would like. They were crafted of sorghum stalks, light brown with dark flecks. Lovely. And symbols of the dignity of labor—which I knew she also would like. I imagined that she might hang it on a wall in her home, so I bought one. “Let me get you a better one!” He took the broom back to the shop and returned with another—not much better or worse, to my eye, but in his view more nearly perfect. Then, sitting next to me on the mini-bus ride back to the hotel, he began a deeper interrogation of me. And this started me wondering: did this guide, deep inside, respect China’s working people, the wielders of brooms—and want my mother to have the impression that “China is silk” only because he guessed that she, from a bourgeois society, would respect silk but not brooms? Or was it maybe worse than that? Was he participating in a societal hypocrisy that pretended to value brooms over silk but in reality did not? From time to time during the trip I tried to strike up conversations with ordinary citizens, people with whom meetings had not been arranged. This was not easy. People constantly formed crowds to look at us, but kept their distance and stayed quiet. I have a vivid memory of one man—I would guess he was about thirty—who was part of a crowd but made eye contact with me. When I tried to address him personally—“What’s your name?” “How are you?” etc.—his lips and eyebrows contorted wildly, from what seemed to me like severe pain, so I stopped. Children were a bit less inhibited, and plainly curious about us. Any walk of ten minutes or more on a city street attracted a long train of them, as if we were pied pipers. I was amused to note, one day as we were walking past the gates of the Beijing Zoo, that some children who already held tickets to go see hippos and giraffes chose instead to come out of the zoo and follow us. “I want to go to the toughest place and serve the people!” He pronounced the words in a sharp, confident, high-pitched voice. “And you?” I asked another. In the years since 1973 I have learned much, much more about how wrong I was in the late 1960s to take Mao Zedong’s “socialism” at face value. I could not have been more mistaken. I am a bit puzzled that others among my leftist-student friends from the 1960s sometimes seem reluctant to face this obvious fact. Is it embarrassing? Why should it be? We were naïve, yes. We believed lies. But we were not the ones who spun the lies. Aren’t the lie-spinners the ones who should be embarrassed? Besides, I feel no need to explain any reversal in my underlying values, because I don’t find one. In the late 1960s, I admired Mao because I felt strongly about things like peace, freedom, justice, truth, and a fair chance for the little guy. Today I detest Mao and his legacy. Why? Because I am drawn to things like peace, freedom, justice, truth, and a fair chance for the little guy.